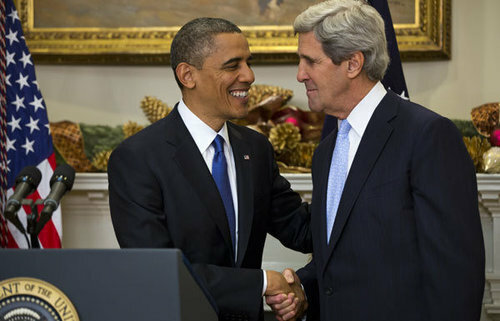 John “Swiftboat” Kerry comes out fighting for his #1 issue: “Global Warming”. What about inevitable nuclear war on two fronts, the Middle East (Iran) and the Far East (North Korea)? Surely forestalling or preventing WW3 is the more immediate issue before the Secretary of State. At least it should be. Let’s not get our expectations up too high for the French-speaking Secretary of State. His priorities are not our priorities. What can we expect from him? What do he and this president have in their sights? May I offer my prediction? Obama, a fervent anti-colonialist, hates America that he thinks to be a colonialist power. Yes, it is true we hold title to Puerto Rico and Guam. We also hold title to several other islands like U.S. Virgin Islands, American Samoa, Northern Mariana Islands, Midway Islands, Wake Island, Johnston Atoll, Baker, Howland, and Jarvis Islands, Kingman Reef, Navassa Island and Palmyra Atoll. In earlier times we also held title to the Philippine Archipelago. I suppose full disclosure is in order: If any territory we now posses could be construed “colonial”, it would have to be Hawaii that was in fact a forced acquisition. The French-speaking Secretary of State and the President of dubious birthright will be working toward a new world order, a world where we will all be equal, except the ruling elite who will be more equal. I foresee treaties that effectively nullify state sovereignty and our constitutional republican form of government. Because of Swiftboat’s’s affinity for all things European, I can see a melding of the United States of America with the United States of Europe. Wouldn’t that be swell? Just imagine a European-style workers’ paradise where employees only have to work about three hours per day and government tends to all your needs. In such a world, guns will be outlawed, because the government will be there to protect you with millions of airborne and post-mounted video cameras capturing your every movement. In Swiftboat’s world, you don’t punch a time clock or check in with anyone at work, because your RFID chip automatically records your location. So, you think I’ve gone into the deep end, the abyss of imagination. Your president is crafting an economic crisis that will enable him to declare a State of Emergency after which all able-bodied young men and women will be required to “serve their country” in uniform. A nation rife with food and fuel shortages will create the chaos essential to set the stage for a ‘savior’. Obama couldn’t do this with Hillary in office. She’s a potential opponent in 2016. Kerry is just the dupe he needs to get his agenda through. Yes, we have all the makings of a crisis-in-a-box. All that was need was to just stir in a French-speaking Secretary of State to Kerry the day. If I live long enough and you remember what you read here today – look me up. Write to me to tell me how very wrong I was. I genuinely want to be proven wrong.